A new year means new organization and refreshed decor at my house. Earlier, I shared some of the changes I made to Cameron’s room to transform her space from messy to marvelous. Well, now it’s Jordy’s turn. Throughout this post I’ll share a few easy boys room makeover ideas which helped to totally transform this room. Before I walk you through Jordy’s recent room makeover, allow me a quick trip down memory lane. It just doesn’t seem that long ago when Jordy was in this room (in our old house). I made the large canopy, eyelet panels and matching bows for the crib decor to match the custom window treatment. I’m so glad I snapped pictures of his nursery for posterity. When Jordy outgrew the crib we bought him this bunk bed that he still uses today. At that time, I switched out the Peter Rabbit theme for a nautical look with sailboat bedding and a huge lighthouse on an adjacent wall. Look how little Jordy is. Here’s a picture of the lighthouse I stenciled for this toddler room. It was really simple to create too. I used painter’s tape to create the outline of the lighthouse, the interior stripes and the upper windows and then I just painted between the taped areas. Then, carefully peel away the painter’s tape for perfect lines. Fast forward to present day. Jordy wanted a blue room but I definitely wanted to stay away from a “baby blue” look. We settled on Denim Wash (#838) by Benjamin Moore. It’s a more mature shade with a hint of gray and I think it’s a good color for a growing boy. To transform the decor, I started with the window treatments. I found these grommet-styled panels at Sears for under $20. Great price, but they still needed a little extra pop. Red is of course always a good color for pop so I added red twill to the panels. Twill is a woven ribbon that is almost like an ultra lightweight, thin canvas with subtle ridges. 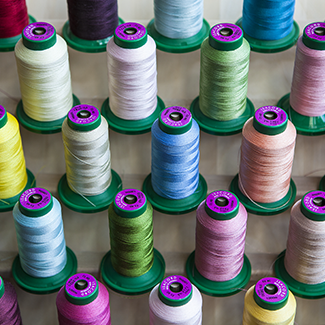 You can find twill at most crafts and fabric stores in the ribbon section. Pin the ribbon down the edge of the window panel and stitch in place. I added ribbon to both sides of both panels. You’ll want to use one continuous piece of ribbon for each side of the panel, so make note of the length of your panels when purchasing ribbon so you buy enough. Whatever the length needed per panel, I suggest you add another 6-inches of ribbon to turn under the hem. I also picked up this cute director’s chair at Pier One Imports as a way to introduce another splash of red into the room. The only thing this chair needs is a little personalization. The canvas seat and back supports for this chair are sold separately and come in red and several other colors. I embroidered the back support piece using a machine embroidery collection by Martha Stewart. If you don’t have an embroidery machine you can also adhere individual alphabet appliques or iron-ons, which are sold at many fabric and crafts stores. Of course, you can never go wrong with assorted pillows so I made two sets for Jordy’s new room. The first duo was constructed in the same way as my music room pillows with one small tweak. When creating the upper flap, insert a small loop and stitch into the seam. Make sure the loop you create will accommodate whatever size button you’re using. You can see how these pillows turned out further down in this post. Here’s a tiny sneak peek at a portion of the second pillow set I made incorporating more embroidery. Look for these finished pillows a little further down in this post as well. I wanted Jordy to have a bulletin board in his room for notes, reminders, pictures, etc. Instead of buying one large one, I created two small ones using some 12″ X 12″ cork board squares and two 12″ X 12″ picture frames. Remove the glass from the wooden frames and instead of inserting a large photo, insert the cork board squares. I was going to spray paint the wooden frames but since they match the wood on the director’s chair, I decided to leave them as-is. I also picked up this inexpensive, rug from Target to add more contrast to the room and to tone down the existing off-white carpeting in Jordy’s room. As you’ll see, lots of small things can add up to a big punch. Are you ready for the room reveal? Before the drum-roll, here’s one more look at what the room used to look like. Here’s Jordy’s new room. I love the pops of red throughout the room. It’s a whole new look and I think it’s perfect for an 11-year old boy. Allow me to deconstruct the changes in greater detail, starting with a closer look at the finished buttoned pillow set for the bottom bunk bed. Remember the sneak, pillow peek from earlier? Here’s the completed set which is assigned to the top bunk. The red twill ribbon adds a nice contrast to the panels and really helps this room pop in just the right way. The personalized chair has become a nesting spot for Jordy’s growing Angry Birds characters. If you have a video gamer in your house, you’re probably already familiar with Angry Birds. Jordy has a nightly ritual involving the big red one. To ensure that I’ve actually checked on him, he decided to start placing the big red Angry Bird in one location every night and if it’s moved to a different spot when he wakes up, he knows that I popped in while he was sleeping. I’m sure I’ll miss this sweet exercise when he eventually (and inevitably) outgrows it. Meanwhile, Jordy’s new bulletin board set is now a good place for notes and photos. Jumbo push pins make the boards even more fun for small fingers to use. Boys have their toys and for that matter, their comic books too. A storage bin in the corner works well as a depository for comics and keeps them all organized at the same time. While on the subject of organization, here’s another tip. Tired of rummaging through your son’s ton of t-shirts for just the right one? Instead of folding them in half and layering the shirts on top of each other in the dresser drawer, consider adding another fold to the garment and then stacking the t-shirts vertically. This method makes every shirt and shade visible and easy to get to. You’ll also be able to fit a lot more t-shirts in the drawer this way. If you have a young athlete in the family, consider making your child a superstar with a super-size personalized wall graphic. Boris ordered this life-size image of Jordy for Christmas. The Fathead on-line shop has loads of options to personalize your walls with just about any photo (not just sports). FUN NOTE FOR PIGSKIN FANS-Jordy’s football team had a 7-1, best regular season record last year. His team (Boris is assistant coach) advanced to the Elite Eight playoffs and finished with an 8-2 record, an all-time best. Go Bucs! While the changes in this room are all low-labor efforts, I will say I didn’t finish the makeover overnight. The room was actually a fairly slow makeover project. I made the pillows last summer and throughout the rest of the year took on the other features in the room here and there (snapping photos along the way) until the space was finally finished. I’m really pleased with how everything turned out but more importantly, Jordy loves the room (and he vows to keep it neat too). Hi jodi’s room is fantastic. I am impress by your all things in room and colour is also nice. As well as I like most cushions message so much. OMG, He is growing up to be a handsome young man. I know you are proud of him. You did a great job on the room as always, I love to see your transformations. Thanks for sharing and Happy New Year!!! Lisa – You’ve done a SUPER job with your son’s room! Bringing in the elements of red serve to move the viewer’s eye around the room, providing rhythm and balance. You’ve also done a great job with editing, keeping only those items that were necessary. I especially like your idea of folding and storing T-shirts vertically, rather than horizontally; now I can take them off the hangers and put them in a drawer, freeing up precious real estate in the closet. Great article, great job, keep up the good work! Although I don’t always leave a comment, I always enjoy your offerings. You are truly a renaissance woman! I’ve never seen anyone who is so versatile in her talent and skill. Last February I made soap and cookies to include on one of my blog posts. The inspiration came from you. I was delighted with the outcome. Now, Lisa, if I could learn to sew as well as you do I’d be a happy camper! Thank you so much for continuing to share your talents with the public. Great design and decoration,, Especially like the chair and the picture of Jordy as a football player. His room turned out great. I loved when my children would get to the next stage and we would change their rooms. Now my daughter is 23, son 18 and I will be so sad to see them move out of their rooms. Excellent job, Lisa! Loved the nightly rituals. So sweet. Jordy will have a lot of fond childhood memories. P.S. That bunk bed is nice. Where did you get it? Perhaps a store list next time. That really looks terrific! Great job! I love Jordy’s room makeover! I love those fathead “skins” hate the price tho:) Happy New Year to you and your family. Really well done. Also, your photography skills are improving, especially evident in the closeup shots in the tutorial. I think you inherited some of your talent from both grandmothers who were into hat-making, carpentry, baking and candy making and hands-on crafts of all kinds. You are continuing their legacy. Thanks. What an amazing transformation! I love the personalized touches throughout the room. He will cherish those pillows for a long time (although he won’t admit it in his teen years). I bet he’s proud of his space – especially that giant wall graphic. It reminds me of redoing my kids’ rooms when they were young – now they ask my advice on decorating their apartments – thank heavens for IKEA! Jordy’s room is great! A great transition from little boy to teen. Wow Lisa — Jordy’s room is AWESOME! I’m so impressed that he doesn’t have a ton of clutter — that’s always been the hardest part for me with my boys rooms. I love the machine embroidery touches — I have the MS font, but can you tell me what font you used on the red pillows — it’s really cute. And that bigger-than-life Jordy is just amazing — Fantastic Job!!! Really nice. Please come to my house… yesterday. Your son’s room looks great. Makes me miss my boy, who is now 23, in the Air Force, and stationed in GA. I used to enjoy re-making his room to fit his growing stages. The Angry Birds bedtime ritual is an edearing story. Thanks for sharing. You are truly amazing, girl – this room is awesome!!! Love what you did with the room. Especially like the chair and the picture of Jordy as a football player. I have a 3 month year old boy,Jacob, so looking at Jordy’s room give me future ideas. Happy New Year. You are one creative lady. His room is precious, just like everything you do.